I am part of a team conducting a graveyard survey in the churchyard of St Nicholas Church, Mid Lavant. 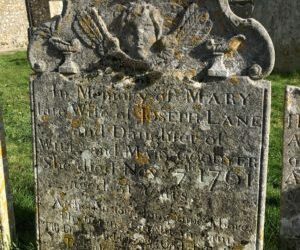 Last October we spent a weekend learning all about the need to record the gravestones of ancient parish churchyards, before the writing on the stones vanishes forever. So at the moment, in the initial phase of the surveying we are recording the location, size, shape, iconography and age of every gravestone. Those which are still legible also have the writing recorded in detail, those which are extremely weathered will undergo an examination via a process called RTI. If I remember correctly, this stands for Reflectance Transformation Imaging. I’ll describe this with photos once those in the team get underway. The procedure itself seems to be fairly straightforward, however the software is pretty complicated…. Anyway, the point of this article is simply to show “What a Difference a Day Makes”!! The stone shown here was completely illegible on a grey overcast day. But…. when the sun came out in exactly the correct position for this particular stone, the words simply jumped out at us and the details of the life of Mary Lane were revealed. Sadly she died aged just 31 years in 1761. Take a look too at the wonderful detail of the iconography!